At PVHC we have chosen Natural Horsemanship as our guiding philosophy. This is a gentle way of building clear communication between horse and rider without being harsh. The goal is for horse and rider to develop respect for one another on the ground as well as in the saddle. Students learn about the nature of horses and how to work with that nature to build confidence and trust. When you learn to ride at PVHC your head trainer is available to discuss your riding goals and expectations. Your trainer will then put together a plan for you and your horse to complete a successful journey with a focus on developing your seat, core and quiet hands, no matter the discipline. You will learn to build a relationship over time with your horse and you will work together until you have succeeded at your goal in a safe and confident manner. Our primary goal is to build a solid foundation for any rider, but we can also take you to next level. 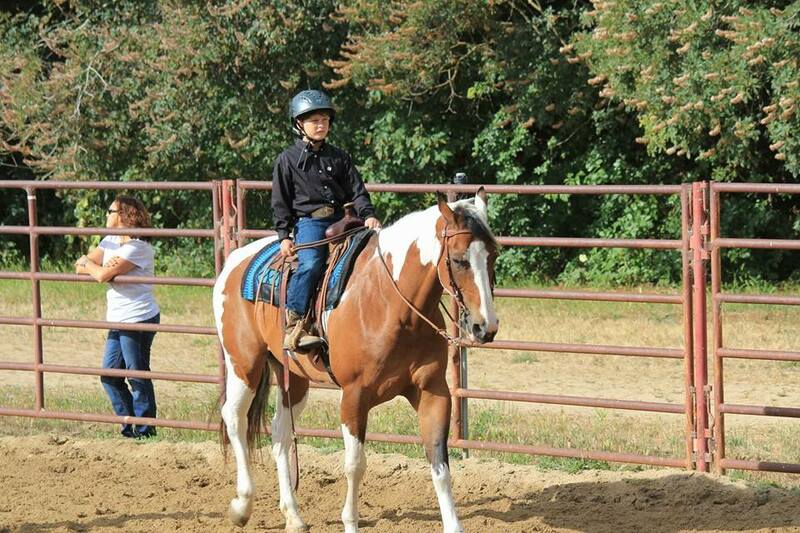 We offer instruction in Western and English disciplines for both young and adult riders. We spend lesson times doing exercises and playing games in our arenas as well as time learning out on the trail. We feel that lessons outside the arena can be extremely valuable in expanding riders' abilities. The trail allows us to apply the skills we have been practicing in the arena. Proper Riding Attire - Long pants, (no shorts) shirt or t- shirt, closed toe shoe with heel (no flip flops or sandals). Height and Weight Limitation- PVHC has a 6 ft. height limit & 200 lbs. weight limit. We have these limits/restrictions in place for the safety of riders and horses. Thank you for understanding. We offer several affordable lesson packages. Our Western lesson program takes our riders through the basics including parts of the Western saddle, grooming, correct hand position, steering and stopping your horse on you own and continues to more advanced riding such as reining and western versatility. Our Advanced Western Team is challenged with guest trainers and judges and off-site lessons where they can focus on their desired riding goals. Our English lesson program, like our western lessons, starts with the basics: part of English tack, grooming, correct hand position, steering and stopping your horse on your own. 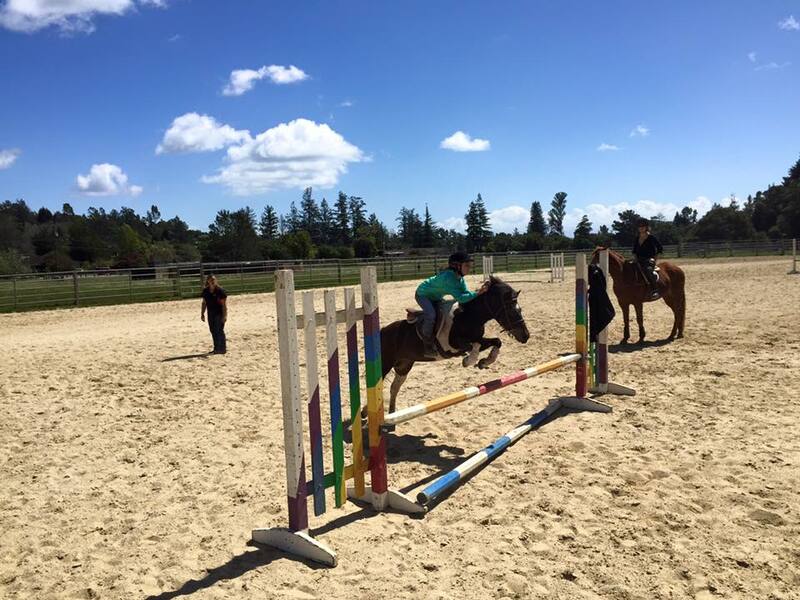 We create lesson plans for each rider's goals on the flat and if they choose, over fences. For those riders who prefer to keep all four feet on the ground we have lessons focused on horse and rider flexibility and strength. And for those riders who wish to jump we focus on forming a strong lower leg and sense of balance. Although PVHC has many programs designed for children, we do offer lessons for adults as well. Whether it's your first ride, or you grew up riding, the PVHC staff will find a horse that matches your current riding ability and design a lesson program to fit your needs. It could be simply getting comfortable enough on horses to go on a beach ride with your child, showing in a horse show or event, or maybe just enjoying some time for yourself! Any group of 10 students ages 4-14 $300. Please call the office (831)763-2733 for lesson availability.